* Keyboard shelf height: 3.75 ("headroom" to bottom of top shelf). * Bottom Shelf heights: 22 to Keyboard shelf; 26 to top shelf. This all-metal compact computer cart is used to set up a portable computer workstation in small spaces. A very narrow cart that will fit virtually anywhere. Very sturdy, this 24" wide desk is used for both desktop and laptop computers, but also used to hold a printer, scanner, copier, fax machine, etc... Used in applications where a mobile computer is necessary. Its perforated tabletop and sliding shelf allow for a cool operation of your laptop. It can be easily accomodated next to any desk, table, or seating area, and then stowed away when not in use (even in a closet). Together with our STS5801, S2445W and S2445-METAL , these are the only desks in the market that allow placing a laptop on the keyboard shelf, thus achieving the ideal ergonomic typing height, thanks to the recessed tabletop and extra deep keyboard shelf. 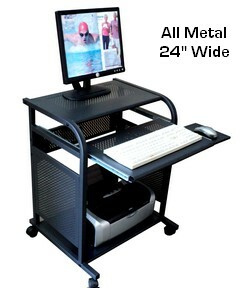 Very sturdy and truly durable, this steel mobile laptop computer cart is very well accepted for commercial applications. Very easy to transport. The front casters have locks. All panels are ventilated and powder coated in satin black. The side panels help hide the wiring, while allowing for ventilation. The rear has open access to each shelf and includes a reinforcement panel, with space to attach a power strip. The shelves also include reinforcement tubes. When not in use, the keyboard shelf can be pushed back, flush with the front vertical leg frames.